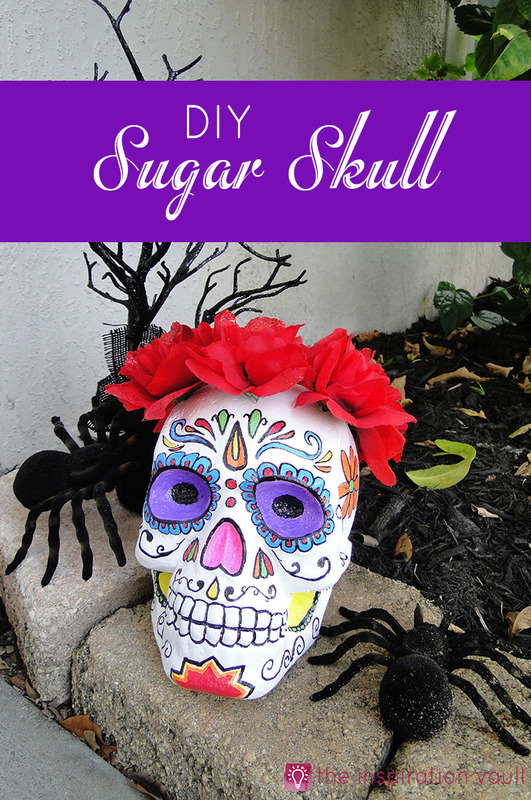 I love all the Dia de los Muertos (Day of the Dead) Sugar Skull decorations that have become popular. 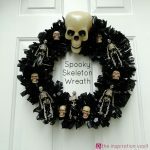 I think they capture the intended spookiness of Halloween but also have a whimsical and fun side. I also like all the bright colors they use. A lot of Halloween decorations tend to be colored on the darker side. 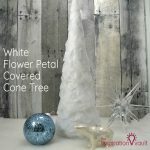 I’ve looked around at several decorations to buy, but every time I think to myself, “I could make that.” I purchased the skull and paint materials at Amazon except for the roses–they were only one dollar at Dollar Tree. 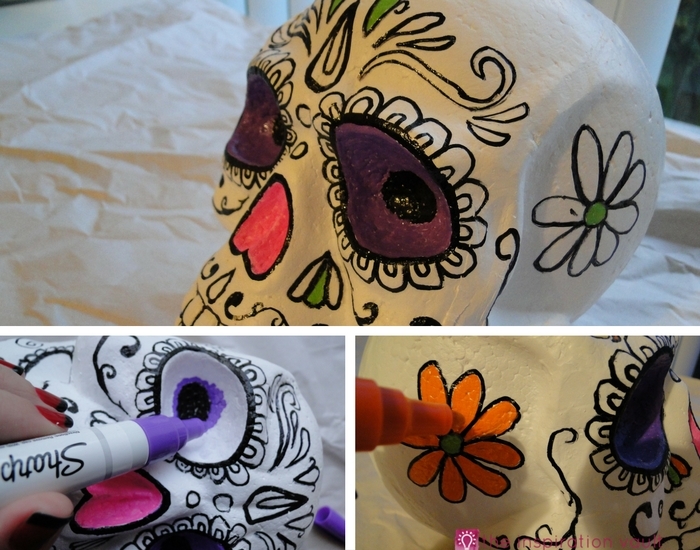 Dollar Tree also had plastic skulls, but for this DIY Sugar Skull, I was concerned with the paint sticking to it and staying. 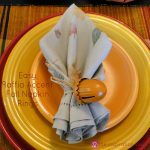 Be sure to Save it on Pinterest if you want to make it later! 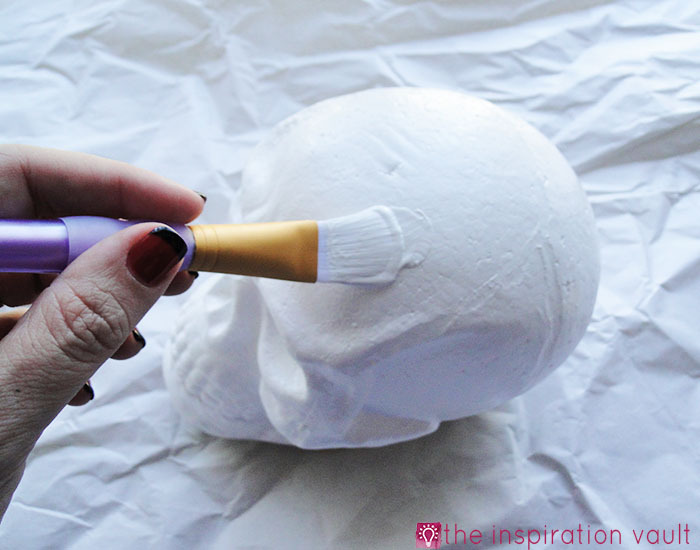 1: Paint the entire foam skull with the white acrylic paint. There’s no need to paint the bottom. If your paint seems too thin, you may need to paint a second coat. 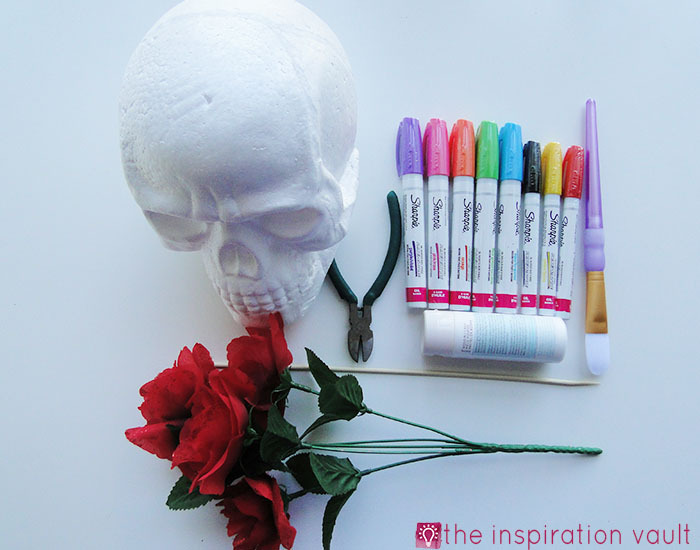 You’ll want to paint the skull white, even though it’s already white, for several reasons: it will look less like Styrofoam and more like bone, it will give you a smoother surface for the paint pens, and a whiter surface will make your design pop more. 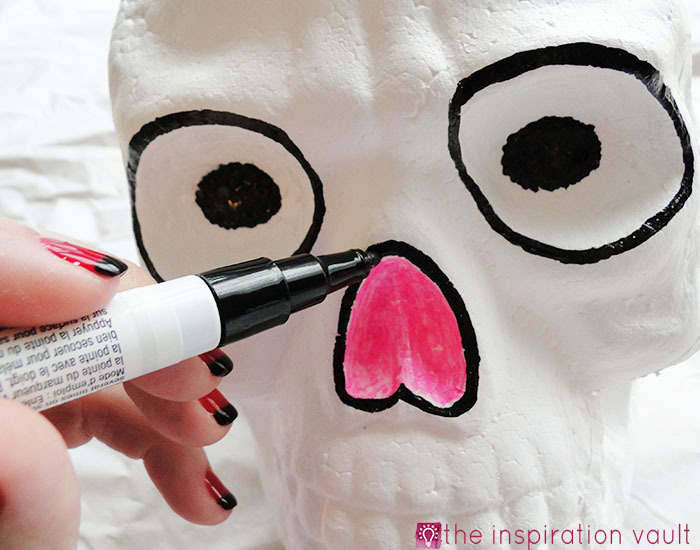 2: Use the black paint pen to color black circles in the wells of the eyes using a dotting motion. Ignore the pink nose, I was curious about how it would look. 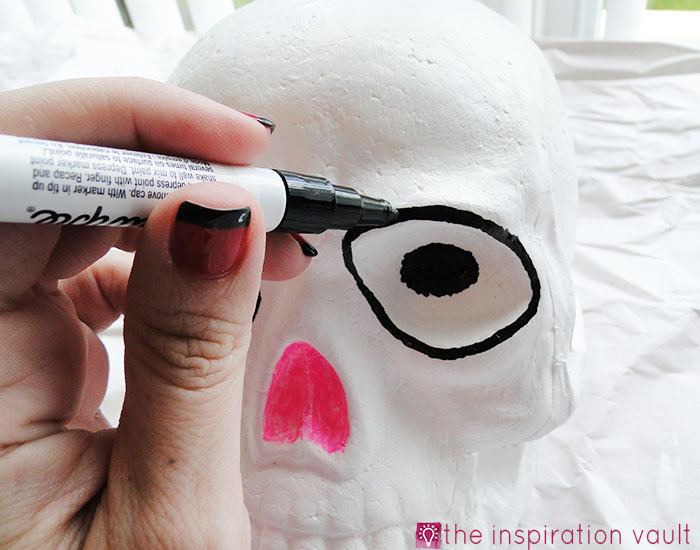 3: Use the black paint pen to outline the outside of the eye sockets. I did two rings around to give it a thicker look. 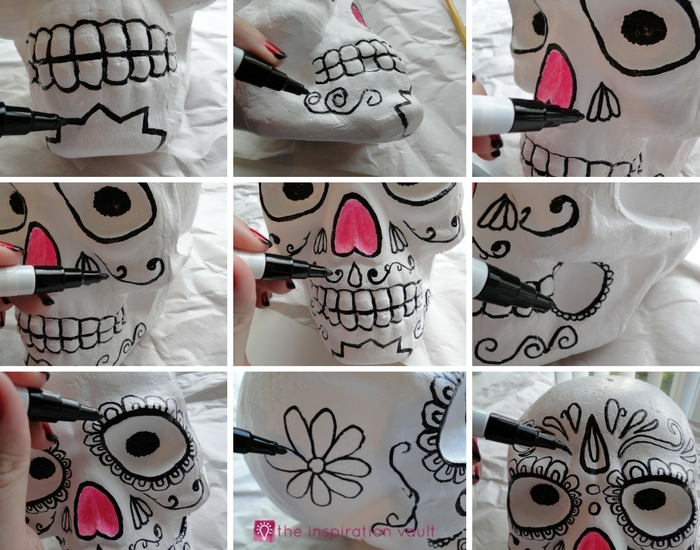 4: Use the black paint pen to do the same thing around the nose socket (?) Is that a thing? Nose hole? 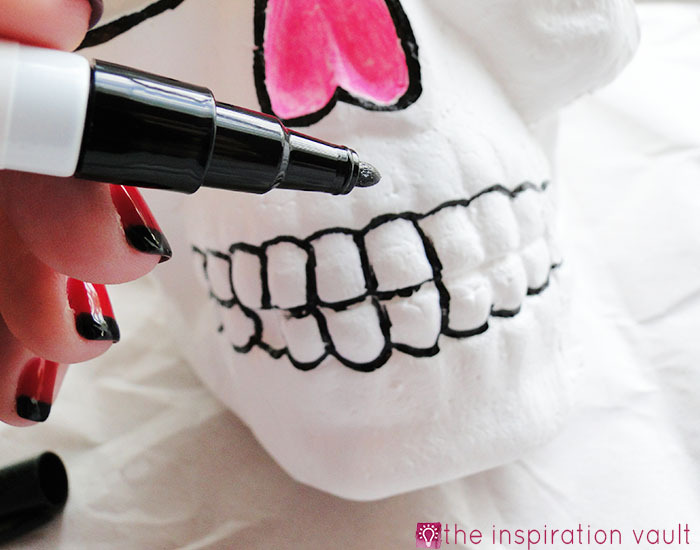 5: Use the black paint pen to outline all of the teeth. This is a big part of just about every sugar skull I’ve seen. 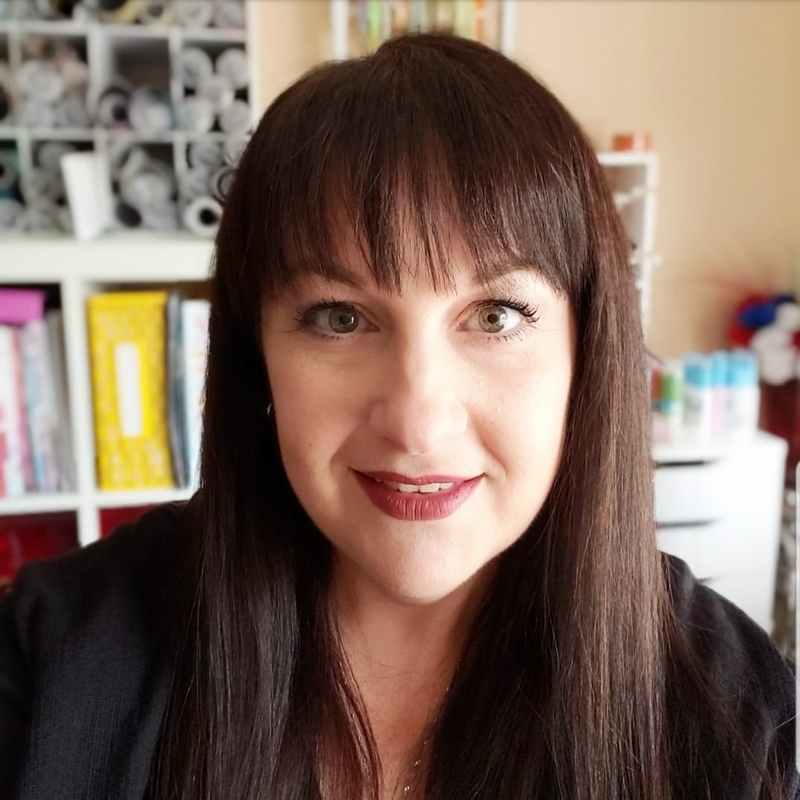 6: For the rest, I looked at some photos of sugar skull makeup and I looked at some coloring pages to get an idea of what I wanted, or most importantly, could actually draw. You will not see any roses drawn on mine since I’m no artist. I stuck to mostly swirls and flower petals with some teardrops here and there. Try to outline or accent edges and try to leave openings or places to color in. 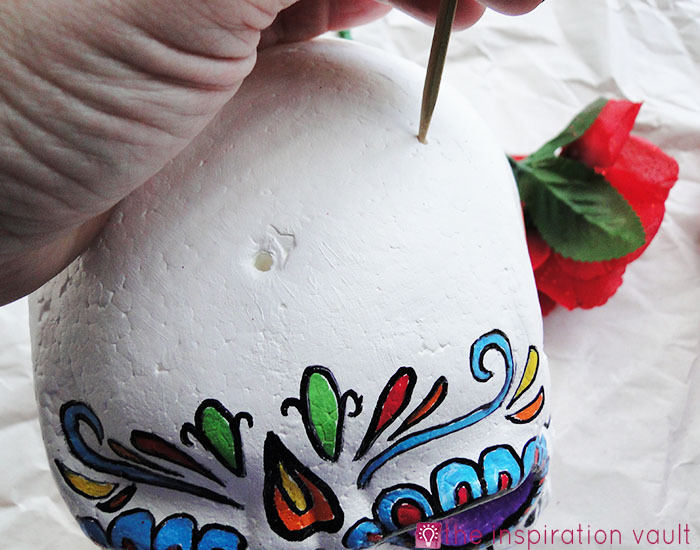 Most sugar skulls I’ve seen are not perfect so I didn’t feel any pressure to make mine flawless. 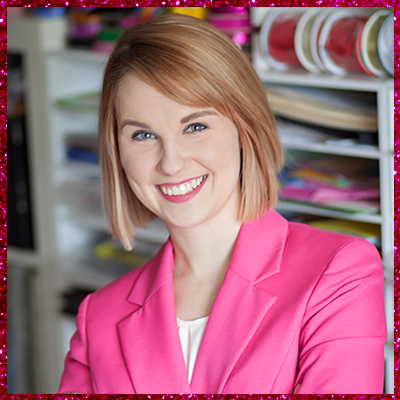 Personally, I think looking handmade is part of the charm. 7: Now for the real fun! You get to color in the design. 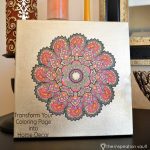 If you don’t want to use paint pens, you can definitely use acrylic paint, it just might be harder to color in some of the smaller spaces. I did all of one color at a time so I could make sure it was evenly distributed. In retrospect, I should have used yellow in the flowers around the eyes instead of teal, but it was too late. The paint pens dry pretty quickly, so you won’t have to wait long. 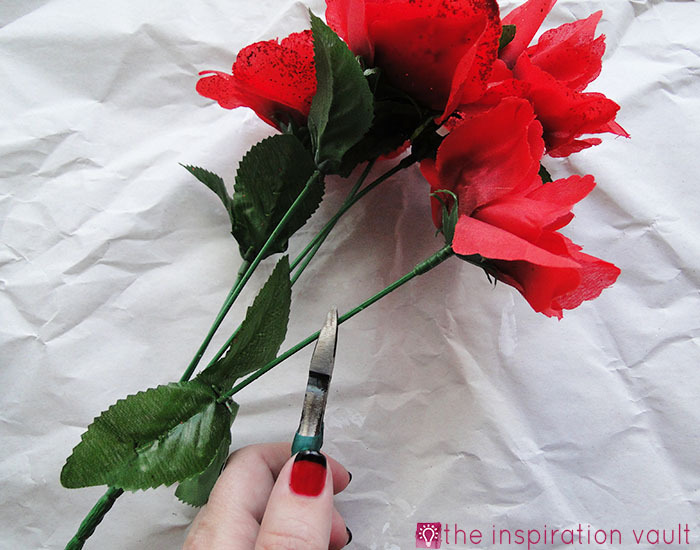 8: Use the wire cutters to clip the roses about three inches down the stem from the flower. 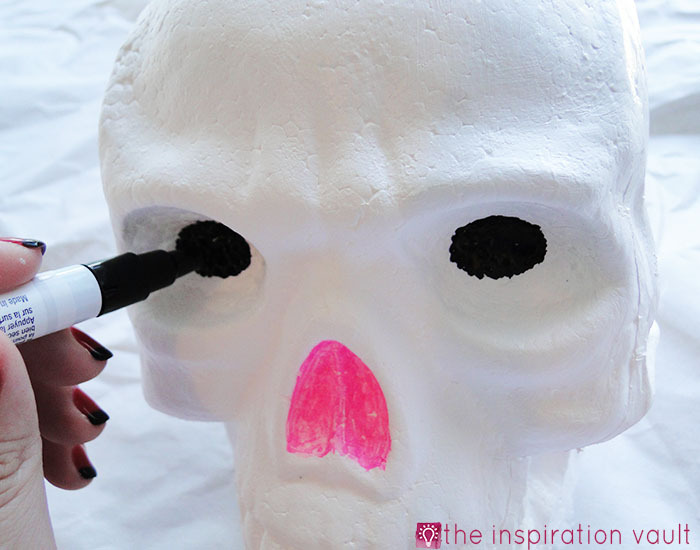 9: You can use the skewer to “pre-drill” holes into the skull if you have trouble poking the roses into the top of it. 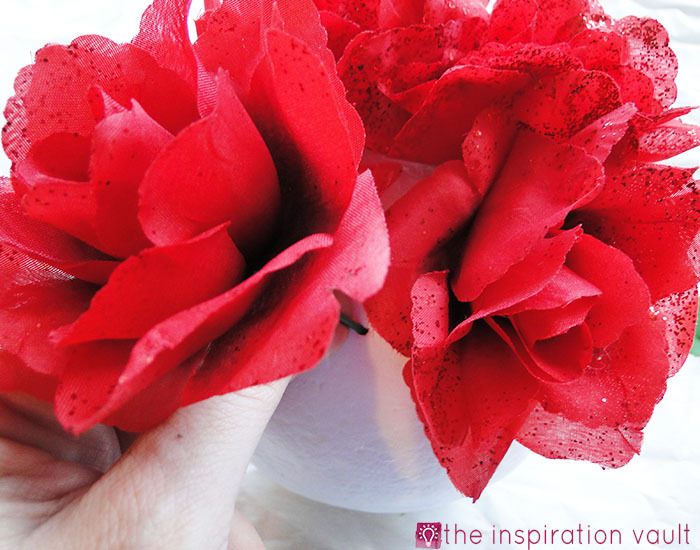 Poke enough roses into the top to make a circle or a crown. I used seven. And you’re done! 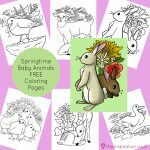 This isn’t the easiest craft, but it is certainly doable, especially if you enjoy doodling and coloring. 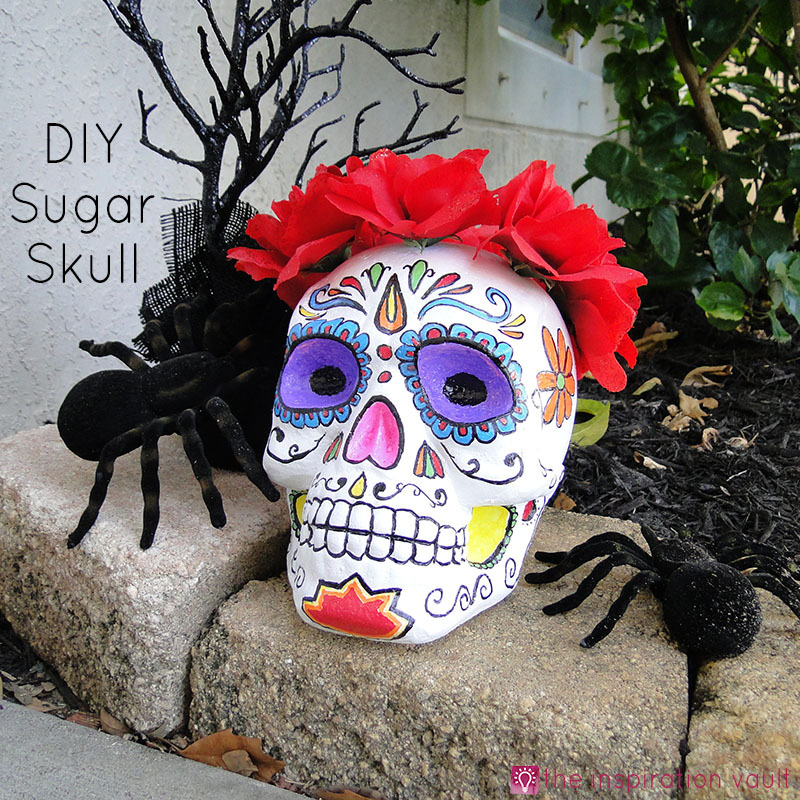 Look, as I’ve said before, I am no artist by any stretch of the imagination, so don’t feel like you have to be a great drawer to make this DIY Sugar Skull. Honestly, I had a lot of fun coloring in all the designs I drew. 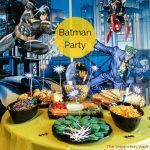 If you’re looking for more bright Halloween decorations, be sure to check out our Colorful Felt Halloween Banner. 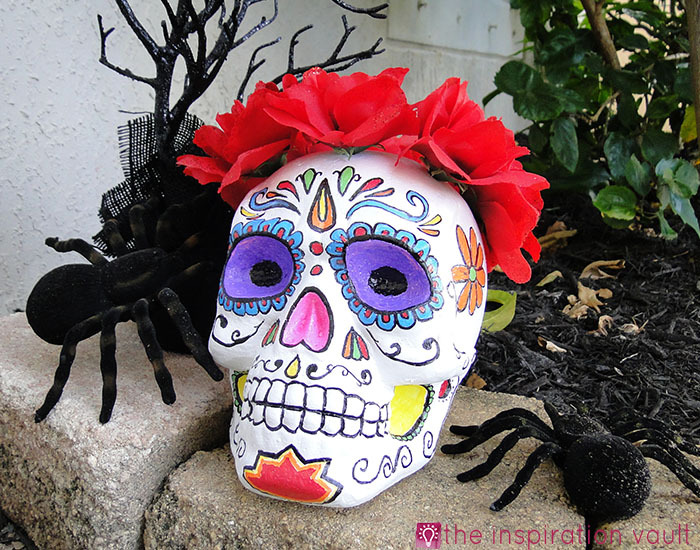 If you’d love to see even more fun Day of the Dead craft ideas, you have to see all of the amazing projects over at All Free Holiday Crafts. I love it! I need to get some paint pens they look so fun. They ARE fun! This was the first time I tried the oil-based ones instead of the water-based pens, and I have to admit, I like the oil-based ones much better. They have a gloss to them and the paint isn’t as thin as the other. 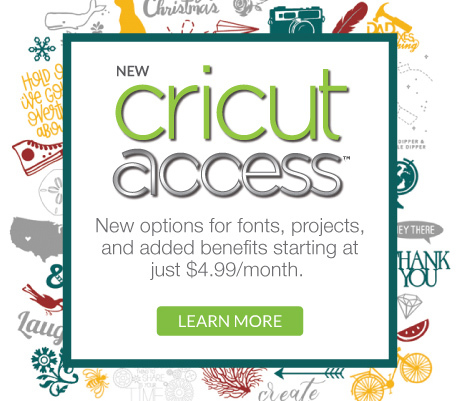 I’m trying to think of more projects now!